Launched in October of 2016, Inception has emerged as a leading provider of 360 and VR content. The company works with reality owners, independent filmmakers, and brands to create and distribute entertainment media across genres including music, art, and culture. ‘Tower of David’ experience showcases some of Inception’s signature styles, merging footage shot on-site at the citadel with CGI and animation to bring the medieval site to life, and using interactivity to allow users to fully immerse themselves in the experience and to encourage exploration and engagement. Inception is fast becoming the leading 360 & VR destination of choice for premium content for millennials. Inception launched in October 2016, and has top apps for all leading platforms. Inception has produced notable art, music and lifestyle content, such as ‘Daydreaming with Stanley Kubrick’, and experiences from the world of Salvador Dali, music experiences with DJs Dimitri Vegas & Like Mike, and a steady content creation with publisher partners including Time Out and Pitchfork. Inception is a leading immersive content network, working on both VR and AR projects with a top cross-platform app available for download. Inception is the 360 & VR destination of choice for premium experiences for millennials. They create born for VR immersive experiences that connect a global audience to their passion points in ways that push the boundaries of imagination using the best-in-class app, leveraging proprietary technologies, and incorporating gaming and CGI into entertainment. The Inception app is available for iOS, Android, Samsung Gear and Oculus Rift. Their hope is to become the Netflix for VR! The Tower of David Museum is the museum of the history of Jerusalem and receives 400,000 visitors from Israel and abroad every year that come to learn about Jerusalem, see the impressive archeological garden, the exhibition halls, the panoramic views of the city, the “Kishle” built in 1834, the Herodian pools, the secret passages and the towers and the turrets of the Citadel. 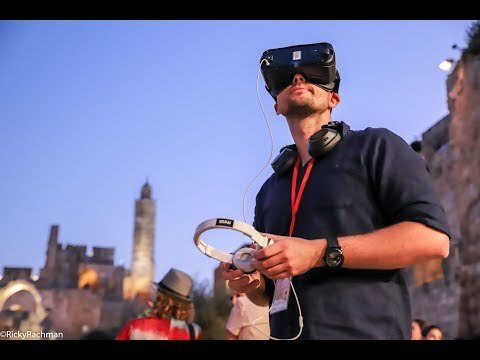 The Tower of David Museum, with its diverse visitor population, makes it a perfect location for testing new technologies developed to enhance a visitor experience be that at a museum, heritage site or tourist center. The Tower of David Innovation Lab’s vision is to connect the world of international digital development to the world of museum content and to find creative and contemporary ways to bridge the gap between the story of the past and the ultra-modern technological experience of the present and the future. The Lab aims to find new ways to bring stories to life, a challenge that every museum, historical, cultural and archeological site in Israel and around the world face today. With the lab’s focus on AR/VR and housed within an Ancient National heritage site, the ToD Innovation Lab is unique in the world, specializing in the integration, piloting and development of AR/VR solutions.